Small changes to lake ecosystems can mean big changes for plants and wildlife that make their homes there. Even though Lake Minnewaska (Minnewaska State Park Preserve, Ulster/Sullivan counties) looks the same from above the surface, life in the water has undergone major change in the past several decades. Lake Minnewaska is a unique “sky lake” ecosystem. Historically, Lake Minnewaska has been acidic acidic. No, it wouldn’t burn you to touch it, but it was too harsh for fish to live in. 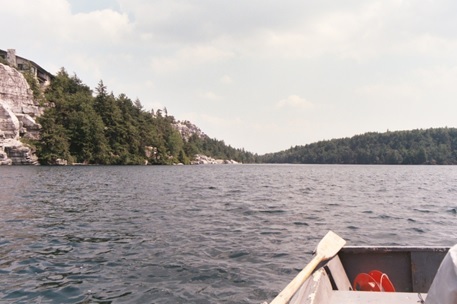 Studies show that Lake Minnewaska was oligotrophic as recently as the 1990s, meaning that nutrient levels were low and the phytoplankton that form algae were absent. The lake was home to other types of creatures, though, including a mat of sphagnum moss which grew up to 20 meters underwater and carpeted 60% of the lake, possible because of the high clarity of the water. The sphagnum moss sheltered two species of salamander which, because of the lack of predators, made use of the habitat and behaved in ways that no one had ever seen elsewhere (Bahret 1996). Since the ‘90s, however, the lake has gradually become less acidic and phytoplankton more prolific, moving the lake towards mesotrophic status. The primary factor in the trophic shift is the introduction of the non-native bait fish species, the Golden Shiner, which was first observed in Lake Minnewaska in 2008. The Golden Shiner eats zooplankton, which are the primary consumers of phytoplankton, leading an increase in microscopic plant life in the lake. Because of these changes, sphagnum moss no longer grows in Lake Minnewaska, and as these trends continue, we can expect further reductions in water clarity, and more plant and fish species to take up residence in the lake. NYS Parks’ Environmental Management Bureau – Water Quality Unit continues to monitor Lake Minnewaska as an ongoing part of a statewide lake monitoring program. Bahret, R. 19996. Ecology of lake dwelling Eurycea bislineata in the Shawangunk Mountains, New York. Journal of Herpetology 30:399-401. Townley, Lauren. Investigation of trophic changes in Lake Minnewaska, a pristine sky lake in Ulster County, New York. Poster, Northeast Association of Environmental Biologists Conference. Online, accessed 8/25/2014.